A couple of years ago I was watching PBS do an interview with a science dude that was explaining the Polar Vortex. I liked his explanation. I liked that he seemed passionate about weather science stuff. I felt like he needed to know that his contribution to the world was appreciated. There’s a kid in grad school that has been predicting the primary election results using data from Facebook. It’s fascinating. He’s very good. He’s doing it for ‘fun’ and because that’s what he wants to do in the world so why not? He put out a tip jar and I threw a couple of dollars his way because good work deserves a little something, something. I don’t know that there is anything I’m more protective of than what I call the Holy Spirit tingle. You can feel it in your bones when you’re in the zone, when you’re doing what you’re uniquely gifted to do. I think we live in a very distracting world. We chase down material things or status or security, and the Holy Spirit tingle is lucky to be an afterthought. The Holy Spirit tingle is quiet and gentle. It doesn’t demand attention. 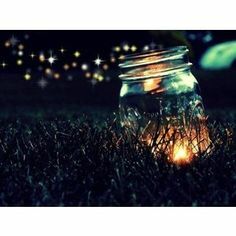 I imagine finding it is a lot like catching fireflies. Once you see it light up, when you see the general area she’s in, you have to change your focus so you can still see her when her light fades away.